When you’re cruising through lush rainforest on your motorcycle, past small villages and rice paddies and hear small children yelling “Falang! 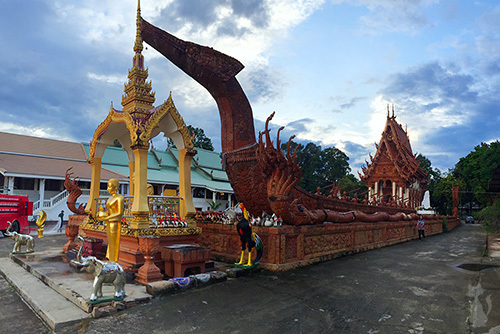 Falang!” every now and then: Welcome (back) to Isaan – “truly Thailand” if you want. home to 4 large universities and way more young, attractive and open minded Ubon girls than you can ever possibly handle. I wasn’t just surprised by the great nightlife in town, but even more by the great number of hotels with exceptional value for money. I paid like 800 Baht a night for a super new and modern room with fast internet, flat screen TV and delicious breakfast all inclusive. The place is called V Hotel Ubon, but there are quite a few of such recently opened hotels all around town (The Rich, The Bliss etc.). Renting a motorcycle isn’t that straightforward though really important in Ubon Ratchathani, you can ask the staff at your hotel for assistance and they’ll call the rental service at the airport. Alternatively there is also a small shop in the town center (Soi Suriyat near the gasoline station). 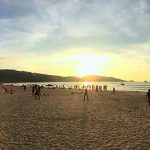 The going rate is 200 Baht per day and again it’s quite important that you have your own vehicle, not just to visit the nightlife places but also to check out any of the mentioned highlights I’m about to describe. 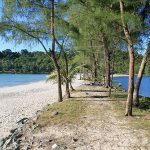 Every town in Isaan has these kind of places, usually parks, where people love to gather in the late afternoon and evening, exercising, playing sports or just snacking in the shade with their friends or partner. In Udon Thani that would be Nong Prajak Park, in Roi Et the scenic Bueng Phlan Chai and here, in Ubon Ratchathani, it is Thung Si Muang, basically a big park in the town center with a temple and lots of vendors selling drinks and snacks. Watch out for the beautiful and huge gold-painted replica of a traditional candle float from the candle festival which is held in July. The most beautiful temple in Ubon Ratchathani. It’s what Wat Nong Wang means to Khon Kaen and Wat Burapapiram to Roi Et. The central chedi is inspired by the Hindu-style Mahabodhi stupa in Bodhgaya, India. Inside is another magnificent golden chedi, which was built in 1956 in honor of the 2,500th anniversary of the Buddhist religion. Another nice temple in Ubon is Wat Ban Na Mueang (right picture). 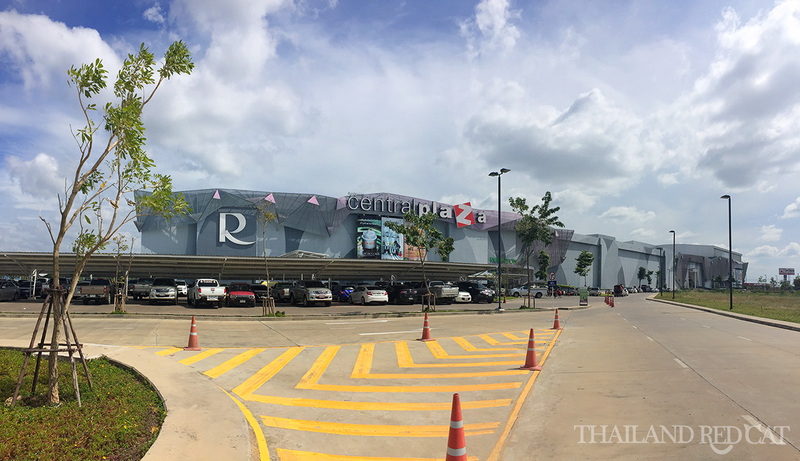 Yes, I’m mentioning a shopping mall in the highlights of Ubon and that’s because it just makes a great place to escape from the heat for a couple of hours, enjoy some Western food and a Latte at Starbucks. The Central Plaza is also great for people watching, especially on the weekends when lots of locals seem to take a “half day” trip to the most modern building in the province. 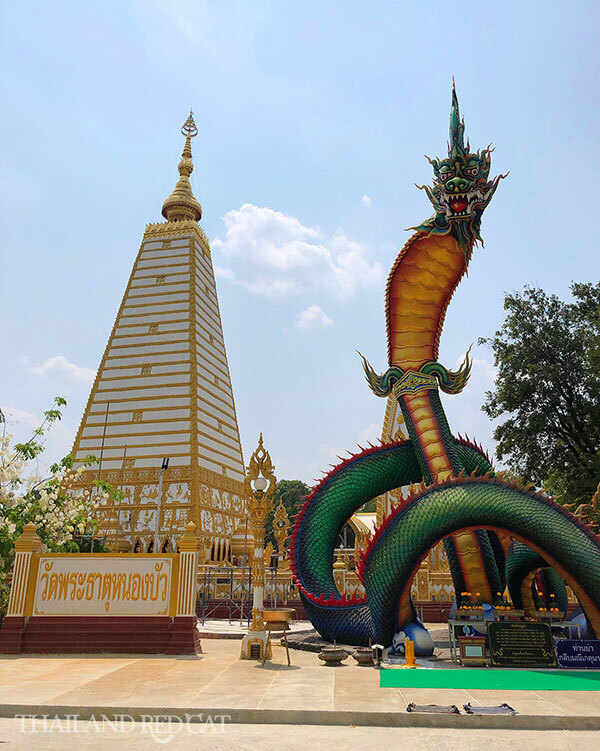 The last 3 highlights in Ubon are all near the border to Laos and make a fantastic full day road trip. I visited the following three places within one day, left my hotel in Ubon at 8am and came back at 6:30pm, driving a total distance of 306 km. Yes, it’s far, especially on the motorcycle but if you leave early then it’s totally manageable and for me this was the highlight of the whole trip. 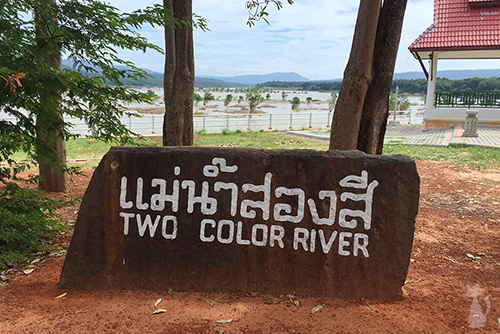 First stop: The two colored river (Maenam Song Si), located in Khong Chiam District. This is the spot where the brown color of the Mekong River and the blue color of the Mun River are joined. Find the exact location of the viewpoint on the map below, it’s inside Wat Khong Chiam (there are basically no road signs leading to it). From there, you have fine views over both rivers and the lush rainforest of Laos on the other side of the Mekong. It may not be the most breathtaking waterfall you have seen in your life, but the scenery all around is quite beautiful and it’s also fun to drive through Pha Taem, the biggest national park in Ubon and basically a huge tropical rainforest with the eastern side connected to the Mekong river which marks the natural border to Laos. It just makes a nice stop on your way from the two colored river lookout (see above) to Sam Pan Bok (see below). They call it the Grand Canyon of Thailand. Frankly, it’s not as grand as it may appear on the pictures (the gorge is about 7 meters deep and up to 20 meters wide), but it is definitely the natural highlight of Ubon Ratchathani. Sam Pan Bok literally means 3,000 holes. The whole areal is made up of sandstone cliffs that run parallel to the Mekong River, and holes which were formed over millions of years are carved out of rocks. They have got a songthaew service running from the car park to the canyon (20 Baht, 5 minutes). The zoo in Ubon is the nicest one I have been so far in Thailand. I love the natural setting in the rainforest about 9 km north of downtown. You can really tell that the animals feel happy as they have plenty of space. In fact, the different enclosures are quite far from each other, so you can either join a 45 minute circuit tour for 30 Baht, or rent a private golf cart for 200 Baht per hour. Make sure you don’t miss the show at 11am (picture) – it’s super fun to watch together with the excited school kids, and free as well. 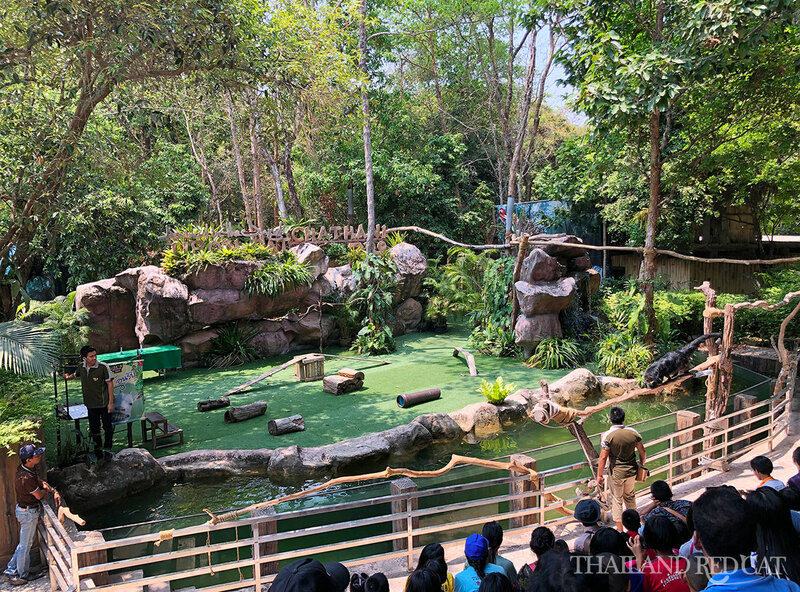 The entrance fee to the zoo is 150 Baht for foreigners and 100 Baht for Thais. The easiest way to get from the capital to Thailand’s easternmost province is obviously to fly. That takes just about 1 hour and 15 minutes and if you book with Air Asia, you can get a one way ticket for as low as 800 Baht. 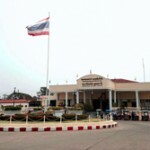 The airpot in Ubon is located just about 2 km from downtown (the city served as a US military base during the Vietnam war) and a metered taxi should bring you to anywhere in town for less than 80 Baht. 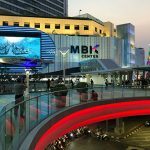 The other two alternatives are the trains – there are 8 daily departures from Bangkok’s Hua Lamphong Railway Station (check the timetable and prices here) and buses – there are even more departures from Bangkok’s Chatuchak Bus Terminal. The price difference to the flights is just a couple of hundred Baht, but if this is your first trip to Isaan, it’s definitely worth to travel at least one way overland so you get to experience the countryside. Sawasdee kap, just found this very informative webside! On october 14 I travel to Ubon. Just be curious about renting a motorcycle at the airport. Can I get just scooters or do the have “real” motorcycles for rent in Ubon? I only saw scooters and no “big bikes”, but this might change in the future when tourist numbers pick up.